When we think about Japanese fashion trends, our imagination often turns to over-the-top street stylings seen in the Harajuku district of Tokyo or in the pages of Fruits. While the distinct fashion subcultures showcased there are certainly still thriving, the streets of Tokyo are brimming with more accessible Japanese fashion trends bound to inspire some of your more adventurous outfit stylings. Japanese fashion girls put their own twist on jumpsuits in khaki and denim iterations, liven up ensembles with bold pops of bright yellow, play with proportions in dramatic maxi skirts and wide-leg pants, and ground their venturesome stylings with black leather shoes that range from classic (ankle boots or Mary Janes) to fashion-forward (platform brogues and pointed-toe flats that harken back to the Elizabethan era). Look no further than below for the latest in Japanese fashion trends. This bold outfit features two of Tokyo’s big trends—oversize bottoms with wide-leg striped pants and pops of primary colors, and yellow graphic T-shirts balanced out by a bold red lip and matching heels. When the outfit takes a more subdued approach to color, interest is created by playing with proportions and incorporating unexpected textures. This oversize and intentionally ill-fitted suede coat does both of those things, and it finds footing with statement black leather shoes. It would be an understatement to reduce this floor-length canary yellow duster to a “pop of primary color.” Paired with the unexpected textures of a fur under layer, a bamboo handbag, and bold statement jewelry, the only subtle part of the outfit is the black leather boots. 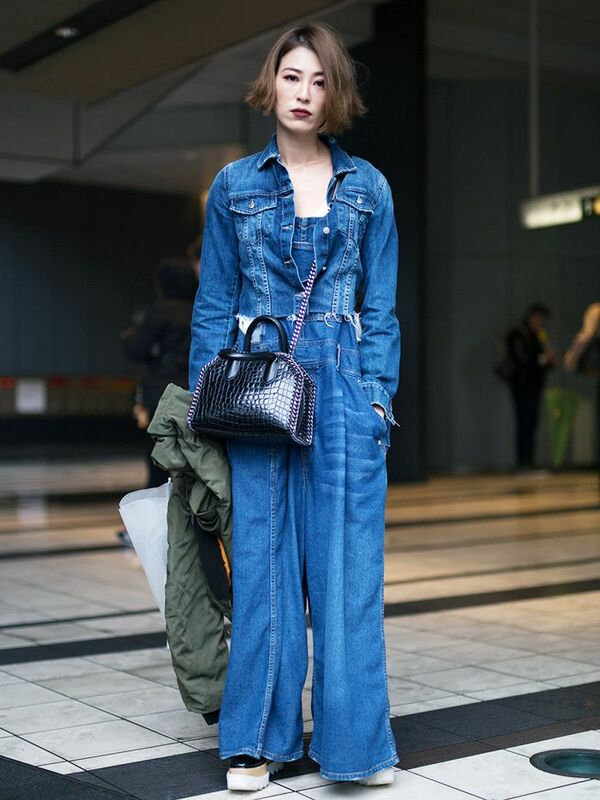 This denim jumpsuit look requires few additional accessories to make a statement. If you look closely, you’ll see that it’s actually a pair of wide-leg overalls topped off with a matching jean jacket. Black leather platform brogues give the denim-on-denim look an added cool factor, and the army-green bomber jacket brings it all together in colder weather. A true jumpsuit, the head-to-toe khaki look is livened up by a pop of primary color via the patterned silk scarf worn as a neckerchief. The jumpsuit’s large fit is made chic with a black belt tied tightly at the waist and oversize bottoms tucked into black satin ankle boots. A tweed jacket and Mary Janes worn with socks make this ensemble wonderfully retro, but the bright pop of yellow and round sunglasses keep the look forward-thinking and cool. Unexpected textures combine with sneakers and athletic socks to create an eclectic ensemble. The look plays with proportions by incorporating a long paisley patterned coat with a knee-length button-down and a maxi skirt. This ensemble exhibits the oversize bottoms trend and plays with proportions. Wide-leg pants (worn extra long) and a blazer are unexpectedly cinched in at the waist with a matching black corset and topped off with an oversize trench coat. The jacquard effect of this maxi skirt adds a feminine touch to the otherwise all-black ensemble, while a leather biker jacket and black leather platform brogues add an edgy vibe. Elizabethan-esque black leather pointed-toe shoes get even funkier when they’re worn with white socks and paired with lace-up pants and a cropped denim jacket with statement detailing. This maxi skirt and button-down pairing is made inimitably chic with an off-the-shoulder jacket, and black leather ankle boots pare down the entire ensemble. This post was originally published at an earlier date and has since been updated. Next up, discover the fail-safe two-piece outfit combo Tokyo girls can’t stop wearing.